Last week, I broke a story reporting that some 28,000 personnel will be authorized to wear the Presidential Unit Citation ribbon for serving under Marine Expeditionary Brigade-Afghanistan in 2009 and 2010. It’s prestigious, unit-level recognition of the sacrifices that thousands of Marines made as the U.S. ramped up the war in Afghanistan more than two years ago. Today, Maj. Gen. Larry Nicholson weighed in on the honor. He commanded the MEB as a one-star commander, and is back in Afghanistan now serving as the operations officer for the International Security Assistance Force Joint Command based in Kabul. Could not be prouder of our team or more honored by the Presidential recognition for the members of the MEB. The success of the MEB came at great cost and we will never forget the heroes who were killed and wounded. The MEB Team possessed an expeditionary mindset to get out and be in and amongst the people every day. MEB lived a rugged and Spartan lifestyle, and stayed closely connected to the local population they were there to protect. They put it all on the line every day and they never wavered. I am [damned]proud of this MEB team, they fought and thought their way through endless challenging scenarios in this most complex COIN environment we call Afghanistan. They have surely added a few lines of honor and accomplishment to the storied history of our Corps. The Presidential Unit Citation is the unit-level equivalent of the Navy Cross. No Marine unit had received one since Marine Expeditionary Force (Reinforced), which was honored for actions during the initial assault on Iraq in 2003. It is brought up about major battles fought in Iraq that should’ve been awarded the PUC. Everyone seems to have forgotten about the Haditha Triad in 2005 and 2006. I was there in 2006 with 2nd Bn 3rd Marines and we sustained the highest casualty rate since Operation Phantom Fury (2nd Fallujah Battle). For that deployment we were awarded the Navy Unit Commendation (NUC). Well I MEF (FWD) was awarded the NUC which included alot of support units that were sitting at Al Asad. So you mean to tell me they rate the same award as we are and we did the actuall fighting. 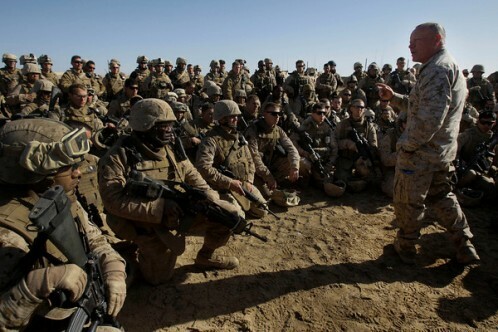 I’m thankful that our service in the Triad didn’t go unnoticed but I think when it comes to major battles like we had in Haditha, Barwanah and Haqlaniyah unit awards should be submitted for a particular unit; not a blanket unit award to a bunch of units who sat in a safe place while a bunch of other Marines and Sailors actually went and fought for the PUC. MajGen Nicholson was my Battalion Commander my first year at Augusta Military Academy in 1974. Although I didn’t realize then how important it was I did realize it when I enlisted in the Marine Corps 13 years later. I never had the honor of serving under him during my six years active and that would be the only disappointment I have of my time on active duty! Former Cpl 2/3 Marine: You don’t fight for awards. If that’s your concern, you’re in the wrong business. I was looking thru various internet sites for General Nicholson.I went to AMA one year post grad in 1970.I believe Larry was in the 9th grade at that time.Just wanted to say thank you for your service to our country.I drove thru AMA 3 weeks ago and glad to report it is still there abet tattered by time. Thanks again. Baxter Hayes, Charlotte N.C.
Baxter, Kenneth, How are you? I looked through the year books and found Larry started at AMA in 1971 the class of 1972. He was 12 years old in Band Company (sixth grade) It was a great education and experence. With the school closed now we still get together once a year for a reunion and offer scolarships to deserving high school grads.